NASA's Mars rover Curiosity captured this image on Jan. 2, 2018, using its Mars Hand Lens Imager. The tubular structures were likely created by crystalline growth, mission team members said. If you heard that NASA's Mars rover Curiosity just spotted signs of life on the Red Planet — well, don't get your hopes up. The odd tubular structures that Curiosity has been investigating lately were probably formed by crystal growth, not tiny burrowing creatures, mission team members said. "They have kind of a square or a parallelogram sort of cross section and form at angles to each other when there's multiple of them together," he told Space.com. "And all of that's pretty reminiscent of crystalline growth." 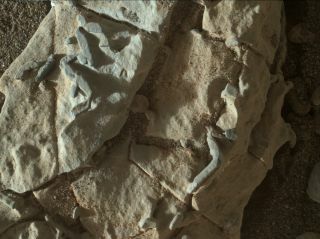 The Curiosity team suspects that the tube features are themselves crystals, or that crystals formed a mold in the rock that was later filled in by sedimentary material, Vasavada added. Both of these scenarios involve liquid water, which suggests that the area Curiosity is currently exploring was wet long ago. That area is the flank of the towering Mount Sharp, more than 1,000 vertical feet (300 meters) above the rover's landing site on the floor of Gale Crater. Curiosity has already found copious evidence of groundwater and an ancient lake-and-stream system on the crater floor and in the mountain's lower foothills. The mission team suspects that Mount Sharp's rocks harbor evidence of Mars' transformation from a relatively warm and wet world to the cold and dry planet it is today — but Curiosity will have to keep climbing to find that transition zone. "We haven't reached the dry part of Mount Sharp yet," Vasavada said. Curiosity has been scrutinizing the weird structures with two different science instruments — the laser-firing ChemCam and the Alpha Particle X-Ray Spectrometer (APXS) — in an attempt to divine their composition. But the tubes are hard targets; though they loom large in Curiosity's zoomed-in photos, the features are only about 1 millimeter (0.04 inches) wide by 5 millimeters (0.2 inches) long. "They're grains of rice," Vasavada said. The results from ChemCam and APXS should be known within the next week, he added. All of above reasoning notwithstanding, the mission team hasn't ruled out the possibility that the newfound tube features were carved by Martian life-forms. Rather, it's just not the likeliest scenario, given the available evidence. Also, it's notoriously difficult to prove that sedimentary structures here on Earth are bona fide trace fossils, Vasavada said, so making that case on Mars would be especially tough, even if it were true. "We just, unfortunately, may not have the ability with Curiosity to tell that," he said.